I've been oddly faithful to the Transformers comics over the years. From Marvel to Dreamwave to IDW Publishing, time and time again I've found myself taking the time to invest in these different comics and follow along with the Transformers and their adventures. And considering how these days I've pretty much given up on most typical Marvel and DC Comics stories, the Transformers remain my continued geeky comic book indulgence. Dark Cybertron is the major crossover event put together IDW Publishing across it's two ongoing Transformers titles, More Than Meets the Eye and Robots in Disguise. The 12-part story is also meant to celebrate the 30th anniversary of the Transformers franchise, including the original 1984 Marvel comic book series. The story brings together a bunch of different story concepts and plot threads that had been seeded across the different Transformers comics ever since IDW Publishing assumed the license over the franchise. Thus we address several big mysteries including Shockwave's massive experiment involving different planets and the truth to the stories of the Metrotitans. 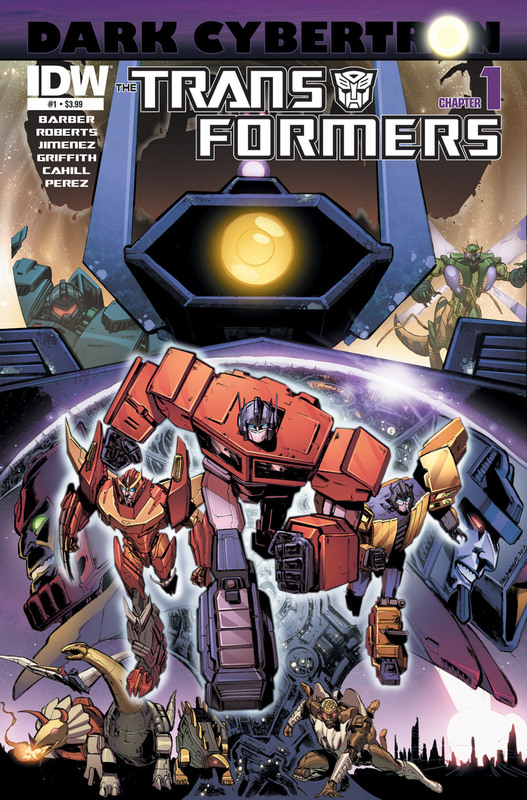 Synopsis: Transformers: Dark Cybertron is an IDW Publishing crossover event across it's ongoing Transformers titles. The story is told across 12 separate chapters, the first and the last appearing in standalone comics independent of the ongoing storyline. The story also connects to the "Syndromica", "Dark Prelude" and "Dark Cybetron Prelude" comics, which brings the total number of chapters to something like 27. Across the different Transformers comics, we had gotten mere glimpses of Shockwave's mysterious Regenesis project, which involved seeing different planets with experimental ores. Now they have reached a point of fruition and Shockwave is triggering a complex plan set in motion years ago. And his goal is a strange one - to open a gateway into the Dead Universe to release Nova Prime and Galvatron from their imprisonment. But how the different elements come together is something that is not readily apparent to our heroes. Orion Pax, once Optimus Prime, manages to awaken the slumbering Metrotitan on Gorlam Prime only to have it seized by Jhiaxus. Meanwhile, Orion Pax and his allies are sucked into the Dead Universe. Shockwave revives another Metrotitan on Cybertron that is more of a zombie-like creature - a "Necrotitan". This monstrosity proceeds to attack the city of Iacon, which is under the leadership of Starscream. Bumblebee and the Autobots eventually join forces with Soundwave and the Decepticons as they try to save the city and figure out what's going on. And finally the Lost Light and its crew get distracted from their search of Jhiaxus and instead follow a most unusual lead that may help them find Metroplex himself. This book is a great culmination of a lot of prep work done by various writers who have worked on the different Transformers comics over the years. And while these were interesting little mysteries on their own, the fact that some of these items had dragged on since 2005, it was nice to see how things were finally going to come together. And despite different creative teams working on the comics over the years, the way everything came together here actually felt fairly logical and coherent. Things do get a little dizzying at times since we have so many different stories to keep track of. We have Orion Pax in the Dead Universe. We have the crew of the Lost Light looking for Metroplex. We have the Autobots on Cybetron. We have the Decepticons on Cybertron. We have Starscream and his supposed Cybetronians in Iacon on Cybertron. And of course we have snippets where we get to see Shockwave, Jhiaxus, Nova Prime and Galvatron. There's so much going on it gets really crazy. I'm glad that they didn't try to limit the stories based on the comic handling any particular chapter. Thus More Than Meets the Eye comics don't limit themselves to the Lost Light and Robots in Disguise comics don't limit themselves to the events on Cybertron. Each issue tracks all of these different events simultaneously as things move forward. And the story truly comes to a head as things get into the final stretch. The art in the comics are a weird mix of the different styles we've seen across the different titles. The Lost Light crew generally maintain their lighter, almost cartoony style of James Raiz for the most part. Orion Pax and the team in the Dead Universe got to take full advantage of the more dramatic art style employed by Livio Ramondelli as seen in past titles like Autocracy and Monstrosity. And everyone on Cybetron was pretty much brought to life by Atilo Rojo. Oh, and we can't ignore the involvement of Phil Jimenez across various issues in this story. The overall plotting of things was primarily the result of John Barber and James Roberts, the primary writers for the two main comics. And they did a pretty tremendous job of juggling so many different plot points and resolving so many long-running mysteries. By the end of things one can't help but wonder what's left for our beloved Transformers to do - but don't worry, it's not quite a tabula rasa situation here. They also make sure to setup the future direction of the different comics and things promise to be pretty exciting. Dark Cybetron is truly a culmination of a lot of Transformers comics history and not the kind of story one should wander into without at least catching up with both More Than Meets the Eye and Robots in Disguise. But of course it would be even better to go further back into the IDW Publishing lore to learn more about everything that our heroes had been through. And this whole epic adventure more than deserves 5 cases of Waspinator being adorable in the background out of a possible 5. Trong cuộc đời của một con người gặp rất nhiều người khác, có người gặp rồi quên nhưng cũng có những người gặp rồi không thể nào quên. Suốt đời cũng không quên. Lưu Phong hạ sơn, một thời gian dài nàng sẽ không thể gặp hắn nhưng điều này cũng không quan trọng bởi vì hình bóng của Lưu Phong luôn ở trong tim của nàng. Kỳ thật nàng cũng không hiểu rõ thứ tình cảm của mình với Lưu Phong là gì nhưng nếu cho nàng lựa chọn song tu tình lữ thì nàng sẽ nguyện chọn Lưu Phong làm người song tu. "Tạm biệt Đình Nhi! Các mỹ nữ dưới chân núi đâu, bạch mã hoàng tử của các nàng đang tới đây!" từ trên núi men theo đường mòn đi xuống, Lưu Phong cảm thấy rất thoải mái. Hắn vừa đi vừa ngắm cảnh trời trăng mây nước...Đình Nhi mặc dù rất tốt nhưng giữa hai người dường như là không có duyên phận với nhau. Hắn thân là nam tử hán, đại trượng phu tuyệt đối sẽ không vì một 'viên gạch nhỏ' mà buông tha 'tảng đá lớn'. "Nên làm gì bây giờ?" tuỳ tiện hái một trái lê rừng, cắn một miếng, Lưu Phong vừa đi vừa suy nghĩ, không biết bây giờ trước tiên nên làm gì. Vốn là hắn phải đi gặp tứ sư tôn, để cho nàng an bài thế nhưng hắn đối với vị tứ sư tôn chỉ thích phụ nữ này quả thực là không hợp nhau, hết xảy ra mâu thuẫn này lại đến mâu thuẫn khác. Đi theo nàng ta làm sao có được cuộc sống thoải mái đây? Hồi tưởng lại tình cảnh gặp mặt của hai người lần trước, Lưu Phong lúc đó quả là có chút không nghiêm túc, không trách đựơc tứ sư tôn của hắn có ác cảm với hắn.